Looking for a strong galloper who will race over a distance? Look no further. This colt is the classic example of the sort of quality miler that Reset can produce. Already the sire of three Group 1 winners, Rebel Raider, Pinker Pinker, and Fawkner, Reset is renowned for producing tough, high class horses. You can view his profile by clicking here. RESET (AUS) (Bay 2000-Stud 2004). 5 wins to 1600m, VRC Australian Guineas, Gr.1. 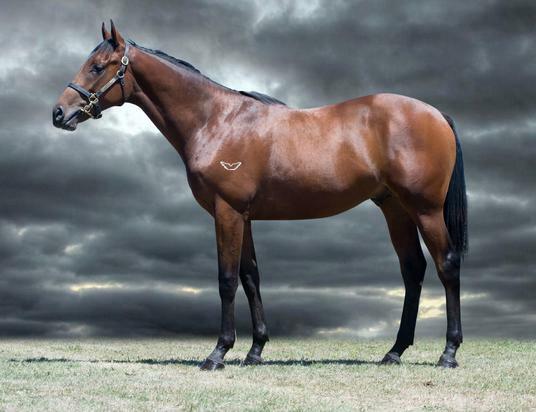 Sire of 665 rnrs, 404 wnrs, 33 SW, inc. Rebel Raider (Victoria Derby, Gr.1), Pinker Pinker, Fawkner, Hauraki, Set Square, Star of Giselle, Set for Fame, Vatuvei, Ms Funovits, Mystic Prince, Knight's Tour, Goon Serpent, Well Rounded, Avienus, Disposition, Cassini, Kiwia, Real Charm, Shoreham, Don'tbabylon, Mail it In, Cadillac Mountain, White Sage, Yourein, etc. CHEVAUCHEE (f. by High Chaparral). 3 wins at 1200m, 1600m, R327,525, Kenilworth Olympic Duel S., L, Ladies Mile, L, 2d Kenilworth Laisserfaire S., L, 3d Kenilworth Jet Master S., L.
Pretty Kool Kat (f. by Tale of the Cat). 4 wins to 1200m in Aust. Sassy Sal (f. by High Chaparral). 2 wins at 1600m, 2000m in South Africa. Hollywood Mo (Uncle Mo). Placed at 3, A$98,435, in 2016-17, 2d Geelong Classic, L, ATC TAB P., 3d ATC Hyland Race Colours P.
Sons of Glory. Winner at 1700m in Aust. Knightly Thoughts (f. by So You Think). Placed in 2017-18 in Aust. RIYADIAN (Polish Precedent). 5 wins from 9f to 1½m, £166,660, 240,000fr., Newmarket Jockey Club S., Gr.2, Ascot Cumberland Lodge S., Gr.3, Doncaster RJB Mining S., 2d Newmarket Champion S., Gr.1, Lingfield Derby Trial S., Gr.3, 3d Grand Prix de Saint-Cloud, Gr.1, Sandown Gordon Richards S., Gr.3, 4th Sandown Brigadier Gerard S., Gr.3. Sire. Wales (Caerleon). 4 wins-1 at 2-from 1m to 1½m in GB and U.S.A, Goodwood Racing Channel S., Newmarket Saxon Street H., Goodwood Royal Navy 2YO S., 3d Royal Ascot Chesham S., L.
Essex. 9 wins from 1½m to 2½m, £74,647, €339,516, Curragh Irish Cesarewitch H., Fairyhouse Sherry Fitzgerald Hurdle, Leopardstown Pierse H. Hurdle, Newbury Trophy H. Hurdle, Tipperary Grimes Hurdle, 2d Galway H., Curragh September H., Leopardstown Craobh Chomortas Na Marcach H., Fairyhouse Ladbrokes.com Hurdle, Punchestown Morgiana Hurdle, 3d Punchestown Champion 4YO Hurdle. CHARLES THE GREAT (Holy Roman Emperor). 7 wins-2 at 2-to 1200m, £105,967, HK$15,073,000, HKJC BOCHK Wealth Management Jockey Club Sprint, Gr.2, Sprint Cup, L, Sha Tin Vase, L, Briar H., Newbury Weatherbys 2YO Super Sprint, HKJC Chennai H., 2d HKJC Chairman's Sprint Prize, L, Sha Tin Vase, L, Happy Valley Trophy, Hong Kong Exchanges Challenge Cup, France Galop Cup, Choi Hung H., 3d Goodwood Molecomb S., Gr.3, HKJC Queen's Silver Jubilee Cup, L, Premier Bowl H., L, National Day Cup, L, Sha Tin Sprint Trophy, L, Chinese New Year Cup, Hong Kong Exchanges Challenge Cup, Chater H., 4th HKJC Premier Bowl H., L, Sha Tin Vase H., L, Chinese Club Challenge Cup, L.
Our Gabrial. 3 wins from 8¾f to 1½m, Ascot Shergar Cup Classic, 2d Ascot Canisbay Bloodstock H., Doncaster Racing Post Weekender Nursery H., 3d York Garbutt & Elliott S.
KNIGHTS BARONESS (Rainbow Quest). 2 wins. See above. UNITAS (Sunday Break). 14 wins-1 at 2-from 5f to 1m, US$458,218, to 2018, Delta Downs B-Connected S., L, Evangeline Downs Louisiana Legends Sprint S., L, Oak Hall S., L, Need for Speed S., L.
ALCHEMY (Rare Brick). 5 wins from 1200m to 2400m in India, Bangalore Derby, L, 2d Indian St Leger, L, Bangalore Karnataka Cup, L, Chennai Stayers' Cup, L, Poona Idar Gold Trophy, L.
Blazing Flame (Cristofori). Winner at 1100m in India, 3d Bombay Hong Kong Jockey Club Trophy, L.